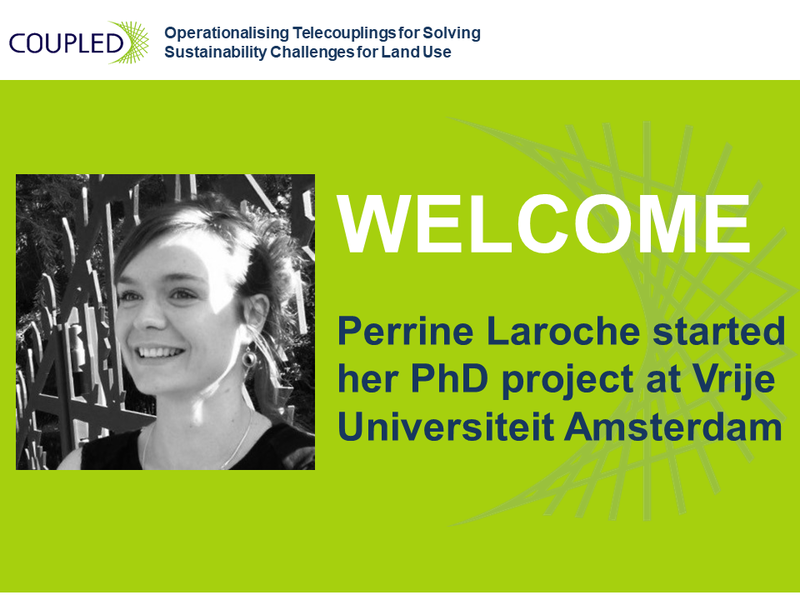 We are very happy to welcome a new COUPLED fellow, Perrine! Perrine Laroche (ESR 04), supervised by Nynke Schulp, will be working on the research project Impacts of changing lifestyles and ecosystem service demands, based at Vrije Universiteit Amsterdam. Perrine comes from France She first studied Geography and Spatial Planning (BSc) in Lyon. She then worked for a Regional Council in the South East of France (Rhone Alpes, known for its gastronomy), on Food Issues in relation to the Expo Milano 2015. Here, Perrine developed a strong interest for agricultural issues, and this opened the road toward her Master’s degree in Applied Economics to Agriculture, Sea and the Environment (MSc) that she completed in Brittany. During and following her graduation, she gained experienced researching in the field of ecosystem services monitoring (European Institute of Marine Sciences), and marine litter assessment (Joint Research Center). Perrine developed an interest in various topics that help her further understand the relationships that people maintain with nature. Perrine’s research in COUPLED follows this trend as it aims to advance knowledge about the impacts that people’s attitudes may have on ecological and socioeconomic systems in a telecoupled context. Her project focuses on the impacts of changing lifestyles and ecosystem services demand. For this topic, the first challenge is to capture the links between lifestyle patterns and ecosystem service needs in order to further understand how people’s attitudes can drive demand for ecosystem services. The second challenge is to map the telecouplings that result from spatial mismatches between the supply and demand for ecosystem services, in order to locate and assess the impacts. Her motivation for joining the COUPLED program is rooted in the learning and collaboration opportunities that it offers, which she believes is a strong asset in the PhD production process. In addition, the recent release of the telecoupling framework offers much new research opportunities. Again, a warm welcome to you, Perrine! We are looking forward to a successful cooperation in the upcoming years. You can find more information about Perrine’s research project here.